"Eyebrow" mod for the W212 (headlights). Anyone consider it? I saw a SWEET all blacked-out W212 on the road (I was gawking from my Chevy, go figure), very sinister and was so eye catching amongst all the cars on the road. The headlights were on but I got a little glimpse of some black "eyebrows/eyelids". I couldn't really see how they looked, but it got me wondering if I think they would look good on my car. I played with Photobucket to color some in, and I can't tell if it looks cheesy and cheap/tacky, or cool. Anyone have them/seen them applied on a 212? K-A, Ive seen them on Harleys in black and chrome. Iam pretty sure that you have to buy the lamp " that way ". I'm not absolutely sure BUT i have seen em. Ah, was under the impression that a good Vinyl shop can just cut one properly to stick onto the top of the unit. Yeah, a black car would look sinister with them if they fit a theme. On a white car, even though pretty much everything on my car aside from the wheels that isn't white is black (or chrome), I fear they'd stick out too much, which when "stick-on" type mods do, that's when they look cheese-ball. I had eyelids on my S2000 and loved them. I'm sure they would look good on the E.
I'm thinking on the E, you could put a lid over the top and have it be in line with the inner fog lamps or whatever they are called. Kind of in line with the hood line on the side. Basically where there is a pseudo-lid on it already. I'm guessing the reflector part of the headlamps? The top part here could be covered I guess? Yep ^^, that's where I saw it done. I'd guess with a white car, it would have to be done in white? I dunno, I fear it might look tacky and "cheap-o" mod. Although, I don't mind a little inexpensive mod to further slightly set my car apart from others. Anybody have good P.S skills? Oh, and I'm not even thinking about the "safety factor" of it. Do they completely cover up the blinker lights? I wouldn't care so much, but since I vinyl wrapped (black) over the side bumper amber blinkers, those don't really show up when the blinkers are on. So I did a really lousy PhotoBucket interpretation of it. I dunno, I'm so torn on whether I'd like it or not! BTW, K, where did you find your smoked tail lights? I think that look is very tight. Yeah I'd assume Vinyl as well. Which means they cover up the blinkers. Usually I wouldn't mind, as I think these cars have too many blinker locations anyway, but I feel like wrapping/covering both of my front end blinkers on the car might be a little irresponsible. Thanks, I actually got them tinted at a specialty wrap/sticker/tint shop. They use a special durable and high-heat withstanding tint that's designed for lights. I got the lightest shade I could, to save from having that cheesy super-black look, and it gives it a bit of a cherry hue when the sun is straight on it. Take at look at this one on the market now...looks very sinister in black!!! Thanks for the pic and info! Yeah, looks mean on black. I still dunno about white though. Still wondering if I looks my style, I guess it's always good to contemplate on something! Keep in mind this is an MB e class and was intended for grownups. Bling does not suit it well. What makes the E63 a mean car is its' simplicity. It is all business. The E350 with the sewing machine motor is best left as natural as possible. Last edited by petee1997; 08-24-2010 at 01:40 PM. Keep in mind this is an MB and was intended for grownups. Bling does not suit it well. What make the E63 a mean car is its' simplicity. It is all business. K-A, I'm sure you want a paint match on the eyebrows. The black one above isn't exactly matching, but does at least give you a decent idea of how it will look. The lids I had on my S2000 were actually fiberglass, so not sure how the vinyl ones will work/look. If I were to do it, I would get fiberglass ones though. 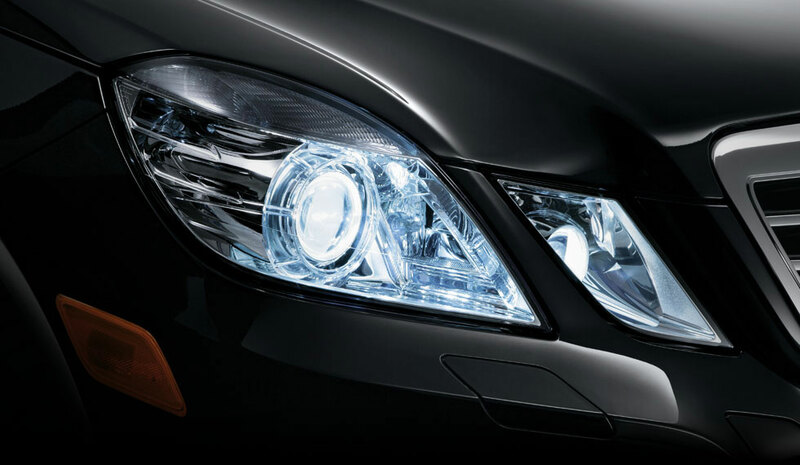 Quick Reply: "Eyebrow" mod for the W212 (headlights). Anyone consider it?